Niches in the fashion industry--you've obviously come to the right place! Model Yomi Abiola has created an amazing segment of fashion, often dismissed by the world at large. Typically, the labor issues in the fashion industry have to do with sweatshops and jobs outsourced from American companies. Those issues are of critical importance--they hedge on human rights and proper wages. However, the models face their own issues as well. Yomi launched Stand Up for Fashion (STUFF) to promote fair labor practices in the industry. Her initiative opposes the use of underage models, promotes diversity, and improves working conditions. 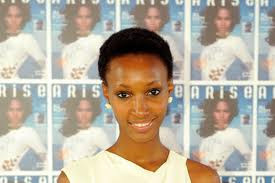 Yomi is a Nigerian model and contributor to Vogue Italia. Her experience is greater than modeling--she also works on cultural issues with the UN. Yomi is not only using her beauty to bring people together, but her brain and dynamic energy as well. “The only time that people from fashion come together is at fashion shows or fashion parties, but in terms of having a real dialog about the business of fashion … it is not something that has been done at all,” Abiola said. Labor issues in fashion are sometimes ignored because of the glam and glitz we see on the runway. Surely there can't be problems. Wrong! Underaged models are not paid as they should be, child labor laws are broken, good health is not encouraged for many models of all ages, and diversity in ethnicity, size, and appearance in general are far from prevalent. It's time the industry and its supporters take a stand to make things as fab on the inside as they appear on the outside. “Every industry comes together” to talk about pressing issues, “but the fashion industry never stands for anything beyond fashion,” said Shauna Mei, founder and CEO AHAlife, a high-end gift website supporting STUFF. As she works to make this issue known across the world, Yomi has made the promotion of "true beauty" a priority, particularly with young women. Often, we find beauty ads showing less of the product's ability, and more editing and Photoshop savvy. This is not the message young women need, especially with bullying so rampant. Yomi is working as a fashion model, model citizen, and role model. We are excited about STUFF and the awareness Yomi is working to promote. You will find more of their projects here, as we all should take part in improving these conditions. Keep up with her journey and follow Yomi on Twitter! To learn more about Stand Up For Fashion, click here!